Why are the most important questions in life so stinking hard? Do you unconsciously make life hard because you think it’s supposed to be hard? What if you could reframe the question to turn a life of hardship of your own making into one of relative ease? What if you had a tribe of mentors to help you? 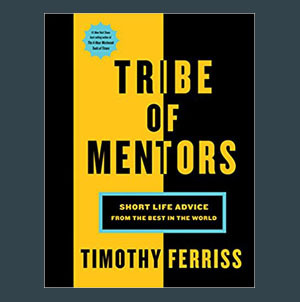 This is exactly what Timothy Ferris did in his new book Tribe of Mentors. He asked 100+ of the most successful people in the world some of the questions he was asking himself. The result is a brilliant compilation of master minds. A treasure-trove of insight. To get these heavy hitters to say “yes” to his idea was an amazing feat. These people are busy. First, he asked. They could always say “no” or ignore his plea altogether, but in order for his idea to work at all he had to put himself out there and ask. Some people were his idols, so it couldn’t have been easy. 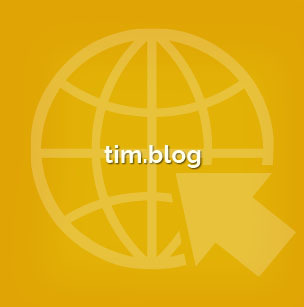 Second, Tim asked questions he knew worked. They were questions he fine-tuned on his podcast or rigorously screened. Sometimes the question is more important than the answer. What is the book (or books) you’ve given most as a gift, and why? If you could have a billboard anywhere with anything on it—metaphorically speaking, getting a message out to millions or billions—what would it say and why? The favorite books of world-class leaders. That normal people are just crazy people you don’t know well enough. Useful habits that successful people find helpful. In case you didn’t believe it before, failure is one of the stepping stones to success. “Many problems of “focusing” are best solved by defining what to ignore.” In seeking bliss: “Expect that you’re going to have to take risks for it. Expect that others won’t necessarily understand.” How to say “No,” in many different ways. What to do when you feel overwhelmed or unfocused. Who will you learn it from? Some of these names have me in straight-up fan-girl mode. It is so neat to hear their personal answers to these questions. Others I have never heard of, but will pay attention to now. In no particular order: Dita Von Tess, Arianna Huffington, Neil Gaiman, Tim McGraw, Brené Brown, Brian Koppleman, Stewart Brand, Ashton Kutcher, Josh Waitzkin, and many others. 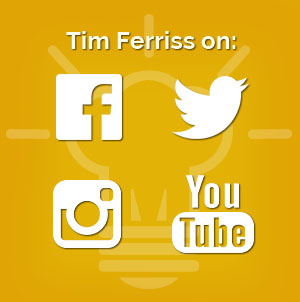 Are you Interested in knowing more about Tim Ferriss?